Local athletes love The Dome! Ever wonder what that big white bubble on Sherman Avenue in Queensbury NY is? 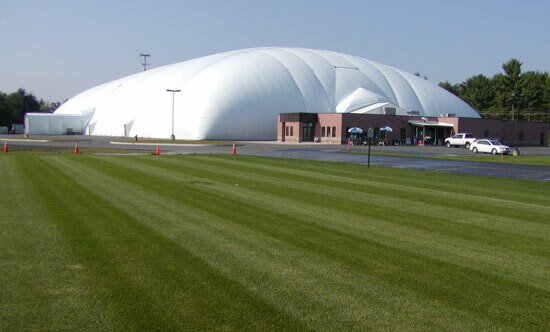 If you don't know, then you're missing out on all the incredible year round activities offered by the big white bubble - also known as the Adirondack Sports Complex, or "The Dome". The Dome has 21 acres of outdoor and indoor fields. With new programs, automatic batting cages, extended hours, and flexible payment plans, The Dome has become even more accessible to local athletes and amateurs alike. And it's open to the public! Many of the programs available are aimed at young children, helping to combat the rising rate of childhood obesity. There are summer camp programs for children aged 4-12, in addition to regular summer sport camps for baseball, softball, soccer and field hockey. Running for nine weeks, from late June to late August, these camps provide kids with a variety of activities, games and crafts to learn from. And, as an extra benefit most summer day camps don't have, rainy days move the kids inside the Dome, so the enjoyment never stops. Find tons of ways to stay active at any age at the Dome! Year round, there are youth and adult leagues and clinics for softball, baseball, soccer, flag football, field hockey and lacrosse. Don't forget about the Little players program for 2-5 year olds. During the summer there are adult slowpitch softball leagues, which compliment the fall leagues, in co-ed, men's and women's divisions. All games are played on the skinned softball fields. In the evenings, adults can head over to play co-ed pick-up soccer and field hockey inside the Adirondack Sports Complex. Soccer is also played outside with the popular outdoor soccer leagues for high school boys and girls and co-ed adults. Conscious of the economic times, The Dome offers affordable rates and discounts on programs. There are siblings and early bird discounts as well as a day free if you register for a full week, that may be applied to each Summer Fun Camp registration. The Adirondack Sports Complex also offers extended payment plans and financial assistance for qualified registrants. What are you waiting for? Get your gear and let's go!